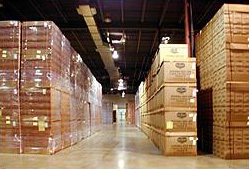 Our current warehouse is located in Carol Stream, IL which is centrally located in the Chicago Metro market. We offer many forms of warehouse and distribution programs and can custom fit programs to your specific needs or requirements. We are a USDA-approved food grade facility and have been approved by such companies as Wm Wrigley Co., Quaker Oats, and Kraft. Our inventory control is an Abecas Insight WMS Software system that is flexible to meet your needs.